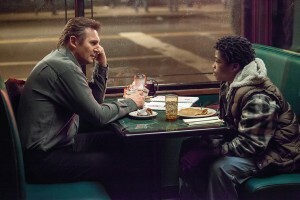 Liam Neeson and Brian “Astro” Bradley star in, “A Walk Among the Tombstones.” Photo Credit: Universal Studios. The legendary Liam Neeson never disappoints. He’s famously known as the protective, paternal warrior and protagonist, especially in action-thrillers like Non-Stop (2014), The Grey (2011) and the Taken series (2008, 2012). In writer and director Scott Frank’s (The Wolverine, 2013; Marley & Me, 2008) thriller, A Walk Among the Tombstones, Neeson continues to impress. It’s easy to jump to conclusions and consider this film the next installment of the Taken series, but you’d be dead wrong. In fact, Neeson dials it back. Based on Lawrence Block’s best-selling mystery novel series, Neeson plays a retired NYPD detective – now unlicensed private investigator in the Y2K era, Matthew Scudder, who is persuaded to help drug lord, Kenny Kristo (Dan Stevens, Downton Abbey 2010-2012), find out who abducted and viciously murdered his wife the previous day. This film is packed with drama, crime and mystery. It’s both dark and clever. Although this film is considered a simpler thriller, it worked and wasn’t over the top. The casting was excellent followed by makeup and a wardrobe to match. The creepiness of nearly all of the men in this film was pretty incredible. David Harbour (Ray, Parkland, 2013), Adam David Thompson (Albert, Unforgettable, 2014) and Ólafur Darri Ólafsson (James Loogan, True Detective, 2014) were especially interesting to watch even though you wanted to simultaneously revert your eyes. The 113-minute run time could have been reduced slightly and T.J., the moody, homeless teen who Scudder meets along his journey (Brian “Astro” Bradley, Earth to Echo, 2014) wasn’t credible in his role as Scudder’s “associate.” While their unexpected friendship eventually adds some emotion, T.J.’s urban slang and the way he carries himself doesn’t scream Y2K like the rest of the film. It felt out of place. There are a few surprising and very well done scenes that will make audiences jaws drop. It’s important not to miss a beat. The film begins with a prologue in 1991 featuring a scruffy Scudder ripping back shots of whisky at a local hole-in-the-wall. Next thing we know, he’s chasing a trio of armed intruders who just shot the bar owner, recklessly discharging round after round on the streets of NYC. We quickly jump to 1999 where Scudder is a recovering alcoholic and now eight years sober. After Kristo discovers his wife’s body parts chopped up and bagged in the trunk of an abandoned car, he will do (and pay) whatever it takes to see these twisted killers in the flesh and personally see them suffer. Scudder is reluctant to help at first, toying between right and wrong, but his protective instincts kick-in as he immediately races through the backstreets of NYC to keep these killers from striking again. Bottom-Line? Although there may be a few infamous nerve-racking phone conversations with the killers, A Walk Among the Tombstones is no Taken 4. Liam Neeson makes this crime-thriller his own and it’s thoroughly entertaining.